Our community is generous with their time and financial support. After pulling together to raise money that supports over 70 local social service programs, we have a lot of people to thank! 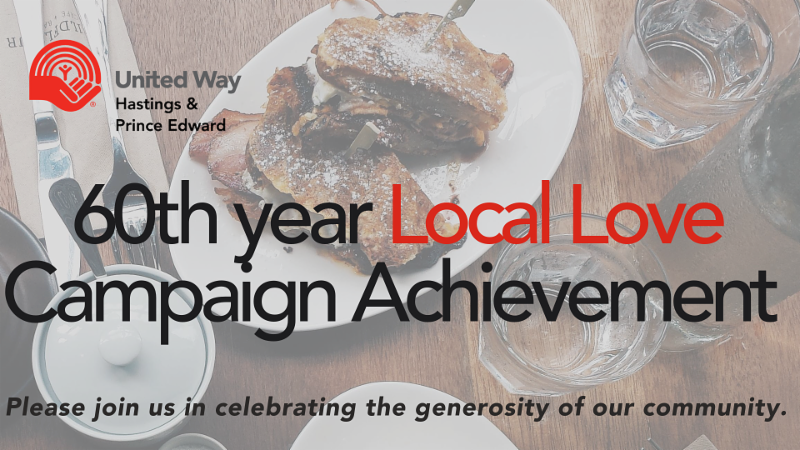 The United Way Achievement Breakfast Celebration is an annual event that recognizes community members that have shown their local love by supporting United Way HPE. Exemplary awards for titles like Volunteer of the Year and recognizing workplaces that have gone above and beyond in their employee giving campaigns will be the focus of the event. A keynote speaker representing community and the importance of giving back will be featured and supporters that have reached milestones in their philanthropy through United Way will be celebrated. The Achievement Celebration receives a lot of media attention as it is the official announcement of the total amount raised during the 60th anniversary local love campaign.